Printable monogram letter art for a gender neutral yellow/gray nursery. This printable makes decorating a safari or jungle nursery easy! Just choose your font and letter, purchase, wait for your file to arrive through Etsy messages, and print your own custom nursery wall art! 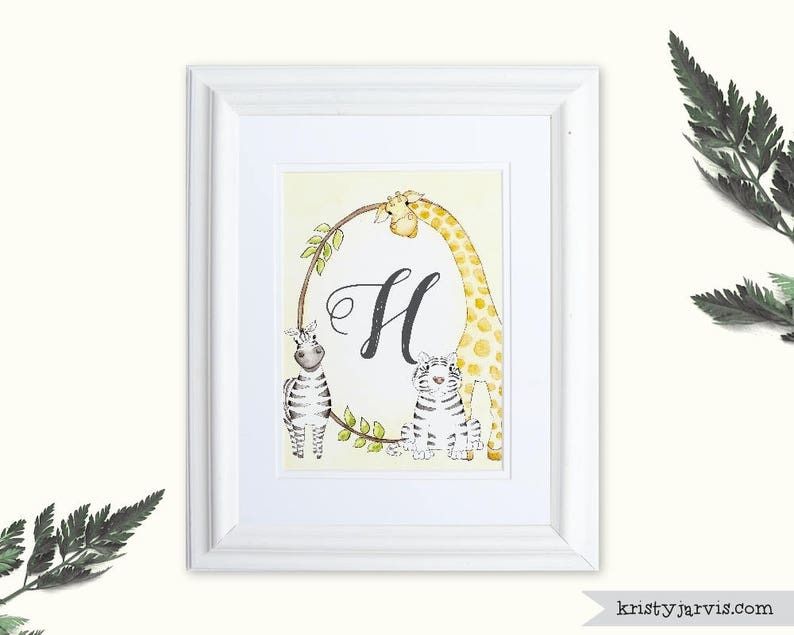 I painted these jungle animals in watercolor then designed an art print to customize with your baby's initial. Print and hang at a baby shower then gift to the mom-to-be! • Please allow 3-5 week days to customize (in most cases, it will be available much sooner) If you need it sooner, please send me a message prior to purchasing to see if it is doable. • Once complete, I will send your printable art through etsy messages. If you would like it sent to an email address, please provide it in "notes to seller" when purchasing. • Download to your computer and print at home or a copy shop (for personal use only)!